Some of the smallest, most overlooked creatures on the reef can be some of the most beautiful. 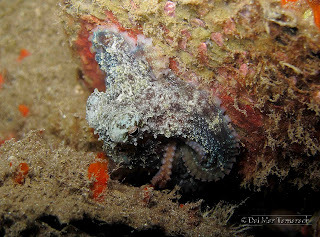 Today's exploratory dive didn't produce a ton of finds but the ones it did turned out to be very photogenic. I am not sure the name of the sight, but somewhere in North Kihei Heidi and I donned our scuba gear and kicked out over coral and silty bottom. 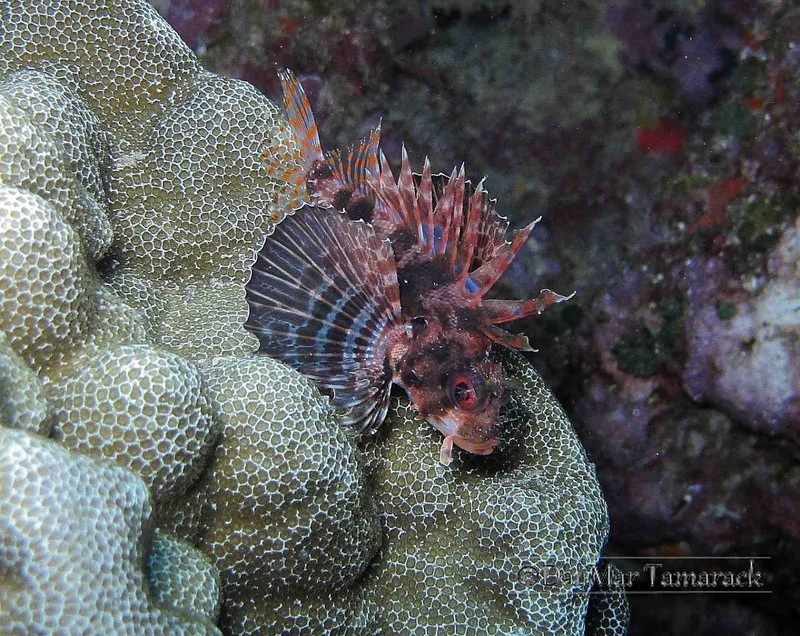 Out a bit deeper we descended and quickly found a pretty rare nudibranch (the orange and blue tipped one), and a Hawaiian Green Lionfish. Then heading out a little deeper something swimming through the water caught my eye. It turned out to be this beautiful flatworm that I later learned is called a fine lined flatworm. 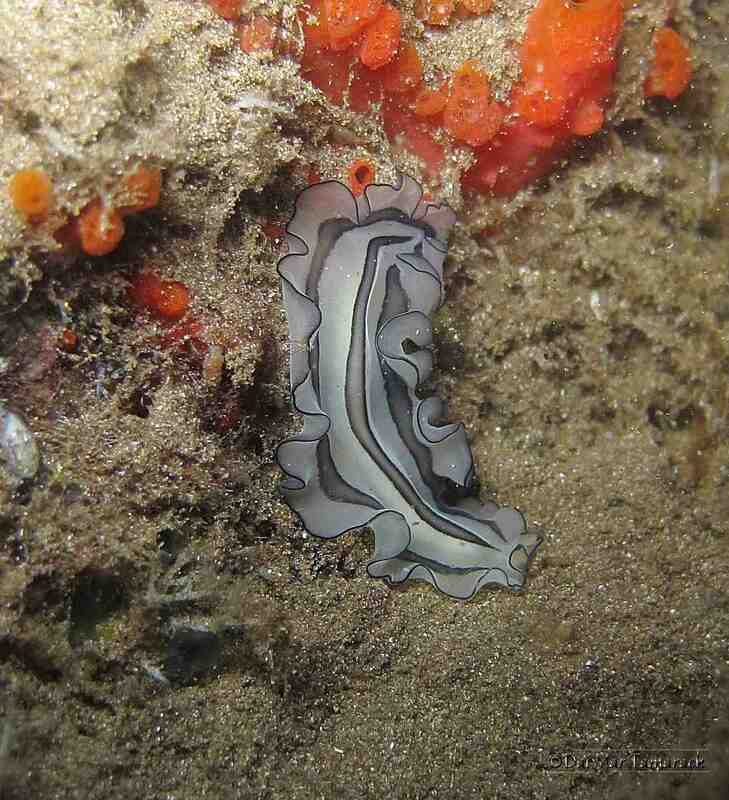 It undulated as it swam through the water much like a spanish dancer nudibranch. 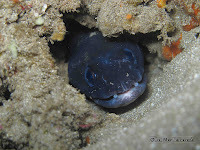 A couple of moray eels and a conger eel, which is rarely spotted during the daytime, rounded out a fun dive. We probably don't have to go back to this spot but now we know the underwater coast a little better. Jolly Green Giant Nudibranch in Maui! 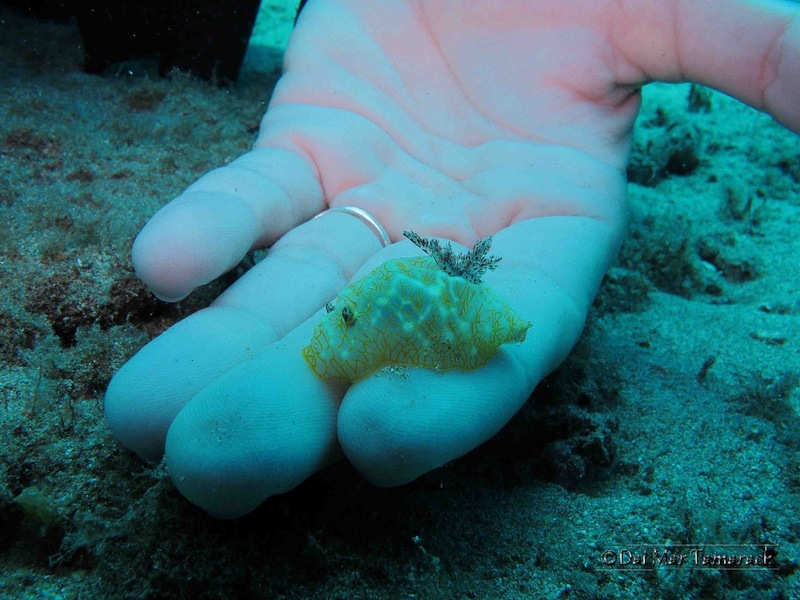 Searching for nudibranchs and other rarely seen creatures has become a passion for Heidi and myself out here in Maui. 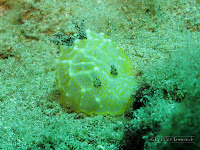 But up until now we have only been searching 'Nudi Flats', our secret dive sive, during the day. 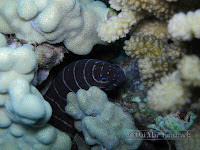 Once we finally decided to explore the place at night it was like a different reef. 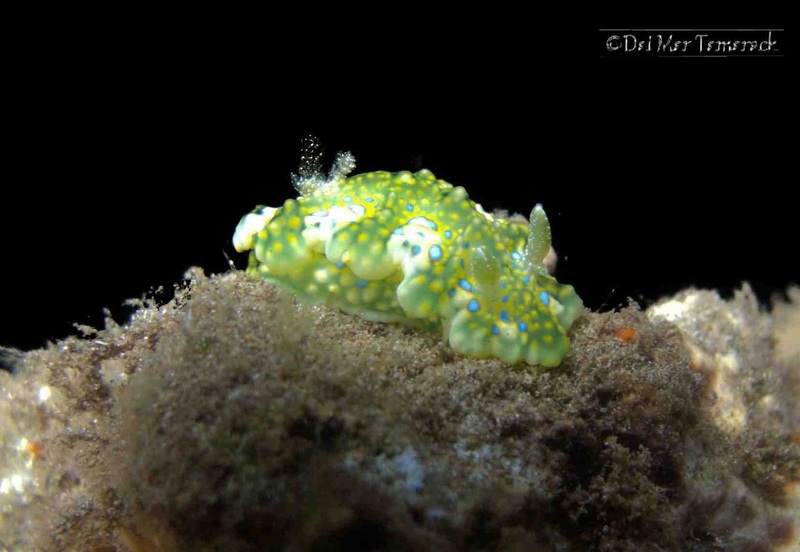 The major find on the dive and one that we have been searching for since we found out about its existence was the Jolly Green Giant nudibranch (Ceratosoma sinuatum). This little guy is considered the holy grail for nudibranch hunters out here in Hawaii, and we finally found one! 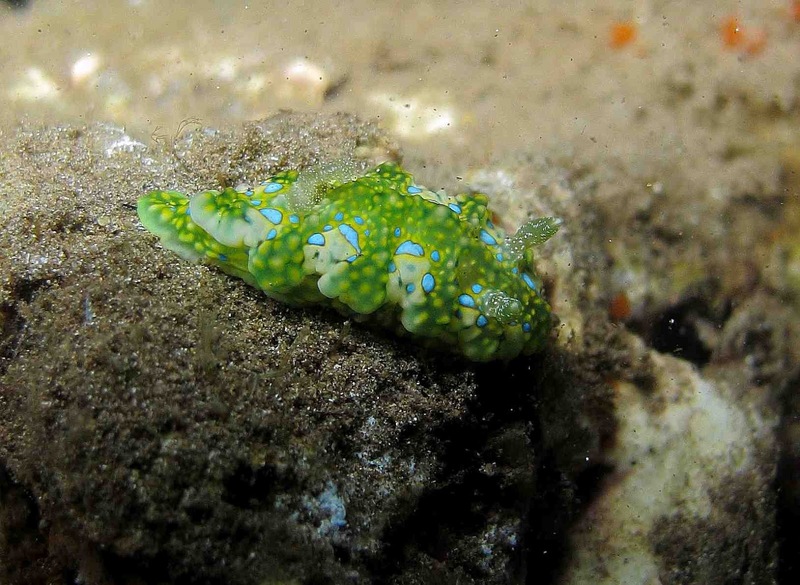 Up until now we havn't seen these beautiful greens and light blues on any of our nudibranch finds. Heidi joked that now we can stop diving. Other nudibranchs and flatworm quickly followed. Snow goddess nudibranchs and kangaroos seemed to be perched out on rocky outcroppings, a giant Umbrella Slug (the orange one with white raised spots) was emerged from its sandy hiding spot and cruised the reef, and all the while crescent octopus darted from hiding spot to hiding spot trying to blend in while looking for a tasty meal. 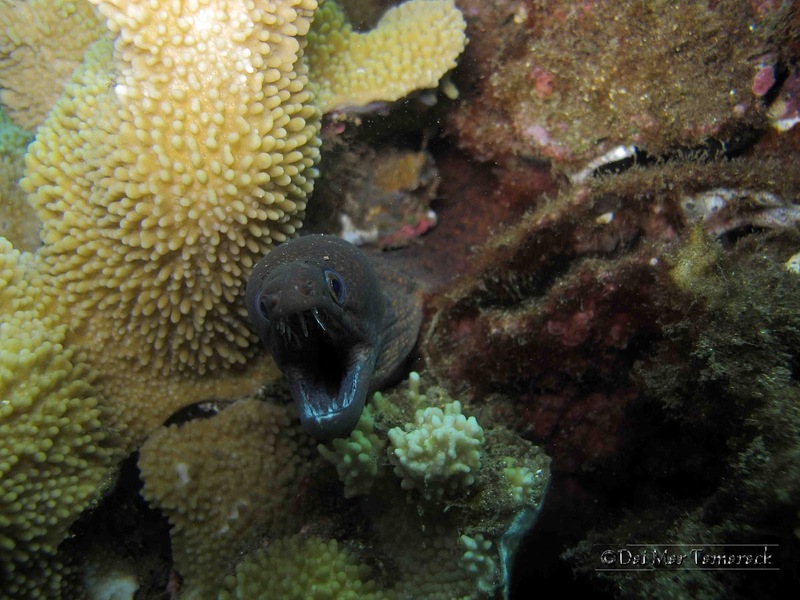 They had to watch out becoming a meal themselves to the several moray eels we also spotted. Sometimes losing a bit of sleep and staying up late will give you a chance to see something that not too many people ever get to see. 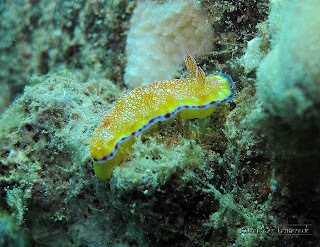 There are several secret places to find some pretty amazing nudibranchs here on Maui. One nudibranch resource that often gets overlooked is the tide pool. 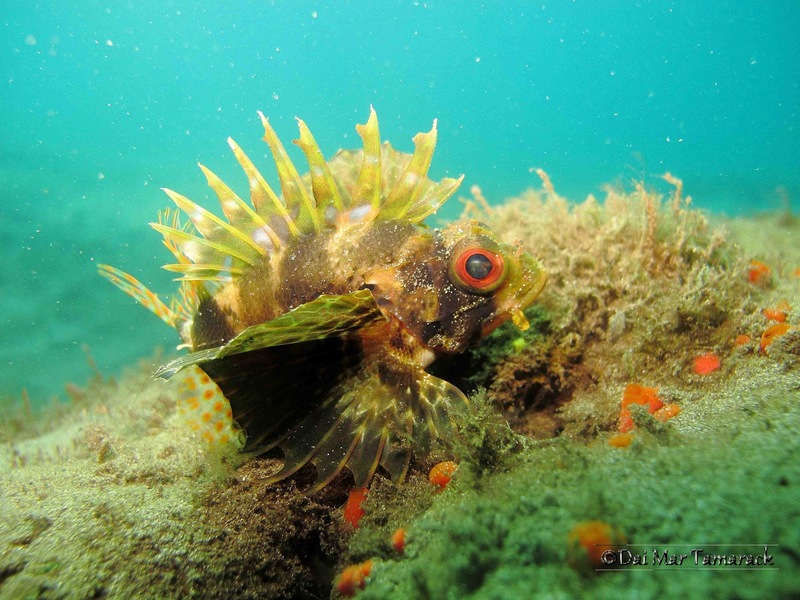 If you go out at night and find a good series of tide pools you can find all kinds of creatures to wonder at. This brightly colored juvenile Spanish Dancer Nudibranch showed off its beautiful colors and patterns as it swam gracefully through the water of one of the deeper tide pools. This nudibranch was about the size of Heidi's finger as you can see in the picture. 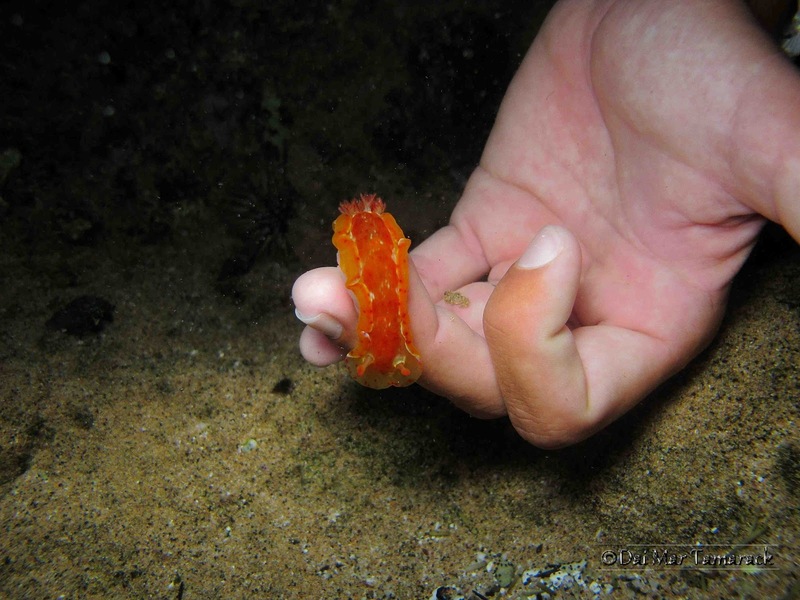 Hopefully it will grow into a nudibranch as large as her arm! 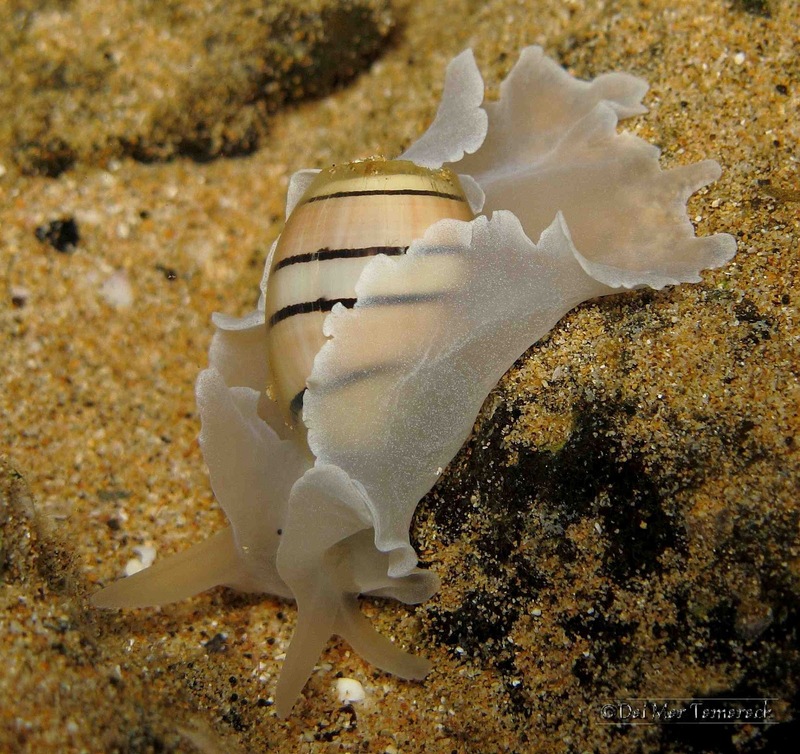 This almost translucent slug which hasn't forgone a shell like true nudibranchs is called a swollen bubble shell, or Hydatina amplustre. 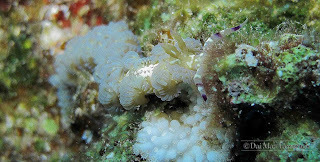 This wild looking nudibranch pictured on the right is Catriona sp. 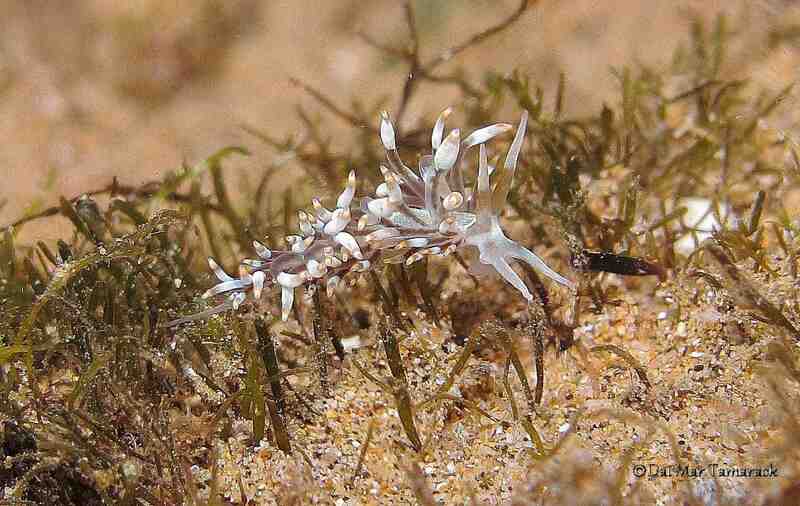 #1, a rarely seen nudibranch first described from Hawaii in 2008. Heidi found three of these very close to each other in one of the bigger tide pools. My buddy Ben and I headed out to catch the little south swell hitting Lahaina side and we took his new toy with us, a GoPro camera. It worked very well with some interesting outcomes. The way it can stop the action and catch water in mid air is pretty amazing. 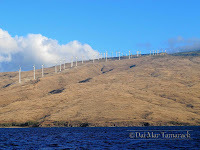 I really enjoyed seeing a totally different perspective of surfing. I learned some things I could do better and found that this camera makes the waves look pretty big. A rare look completely encased in the tube of a wave is another added benefit of having a GoPro camera. 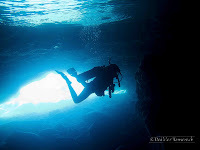 Searching the walls and ceilings of overhangs and caves is a must at this scuba site known locally as 5 caves or 5 graves, or turtle town after the abundant reptile residents. While most scuba divers are watching for turtles and other mega fauna Heidi and I were on our typical hunt for smaller creatures like nudibranchs. 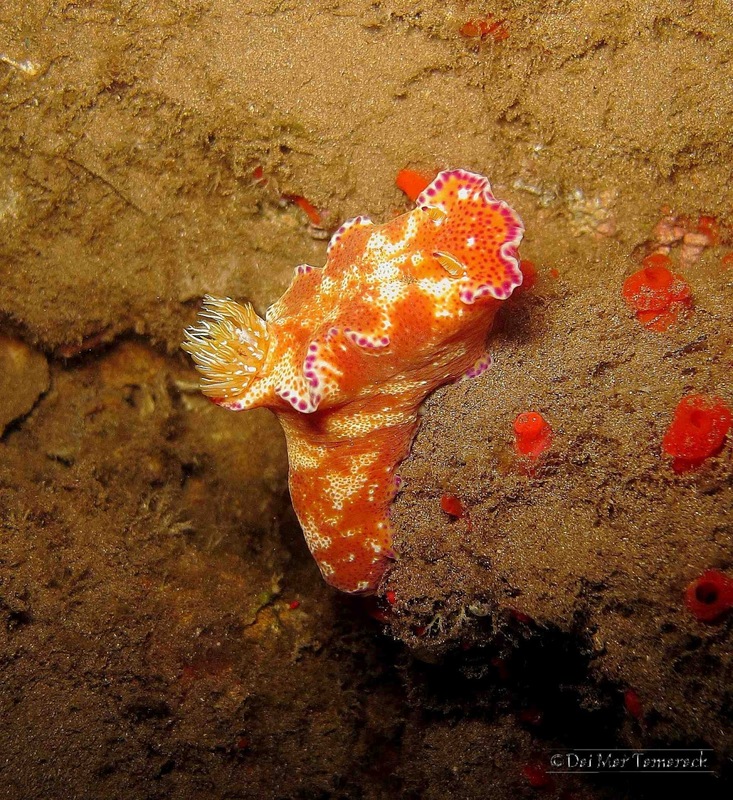 5 Caves is a stellar nudibranch dive, day or night. 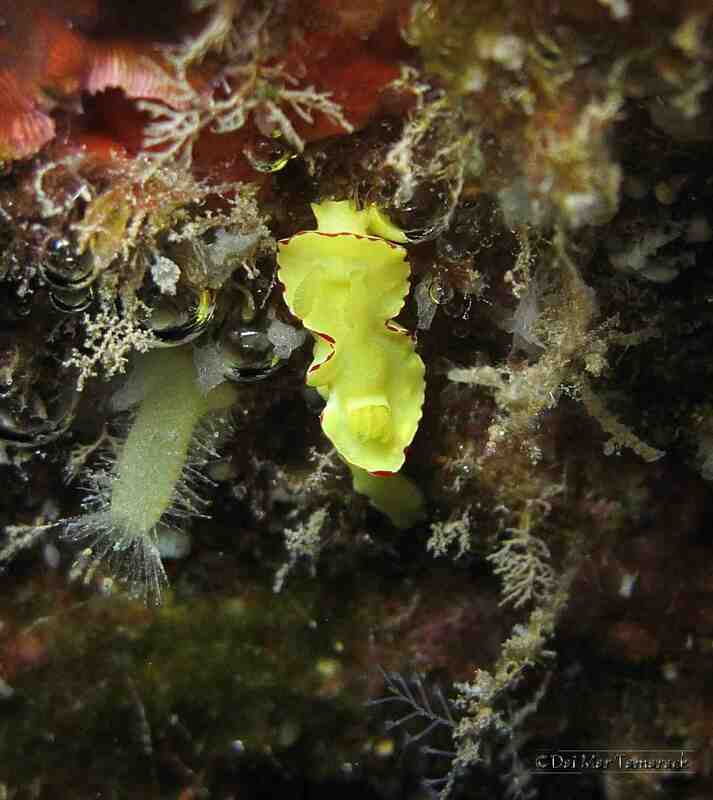 We get the usual suspects here of phyllidia, white margin, and fuchsia flatworms, but if you looks very hard the dedicated nudibranch diver can be in for a real treat. Today it was that and more! 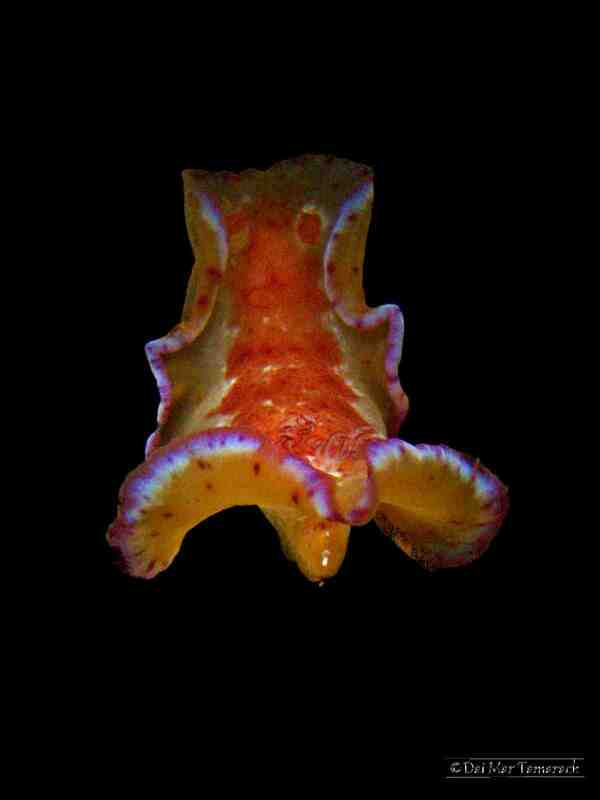 After seeing a big octo on the kick out to the reef Heidi got the sightings started with a Tom Smith's nudibranch. 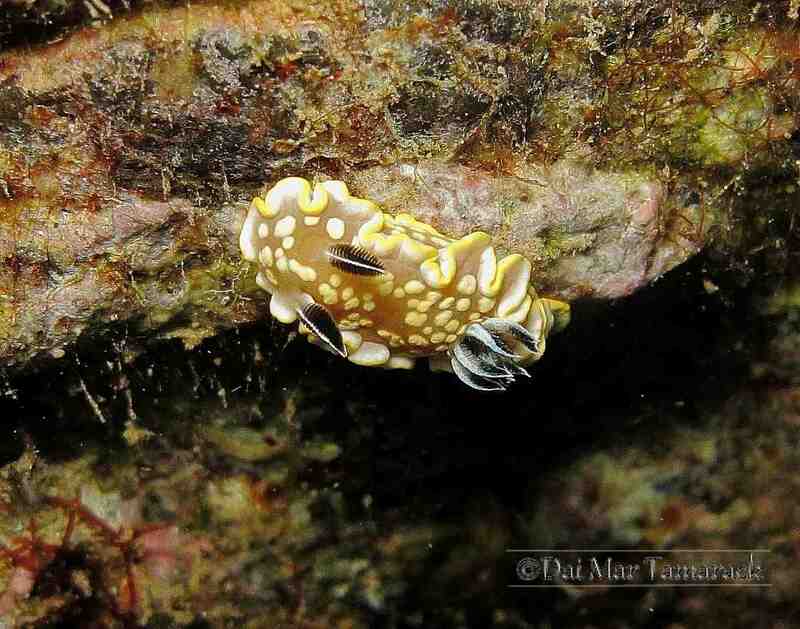 As I was taking this picture of it I noticed just to the right a gold lace nudibranch almost perfectly blending in. That is usually the way of nudibranch spotting. Once you stop and really look at an area you will find more and more. 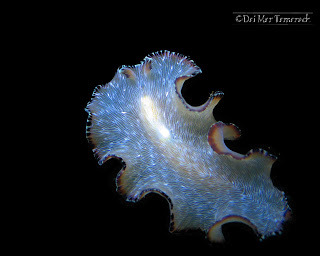 Heidi also found another gold lace on the sand, two yellow noumea which we rarely see, and then the real find, a white spotted nudibranch. We have only seen this species once before so we were very excited. 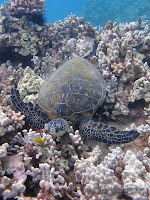 To add to the excitement of all these nudibranch finds I saw this turtle swimming away from the reef out over the sand. 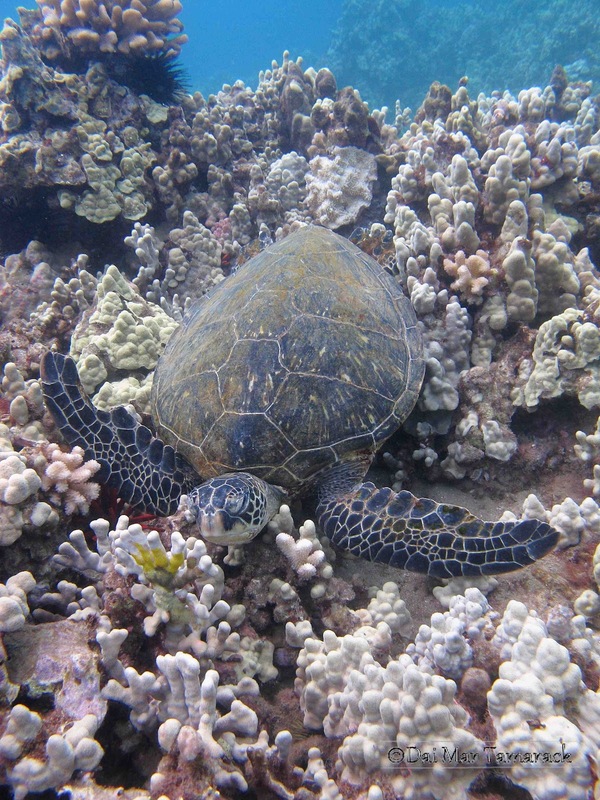 I did a double take at the turtle's face and recognized it is an endangered hawksbill sea turtle. I have only seen this species four other times and never before at 5 Graves. 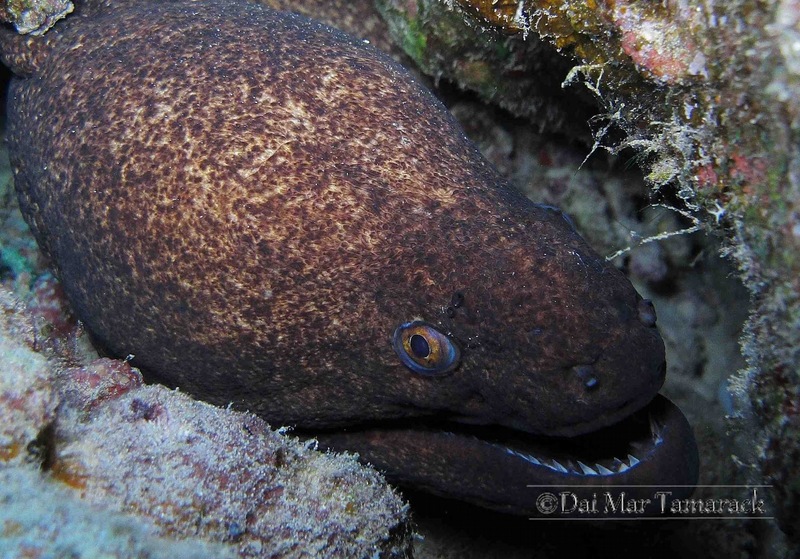 The dark scutes (scales) under the mouth are a dead giveaway. Green sea turtles only have dark colored scutes above the mouth. 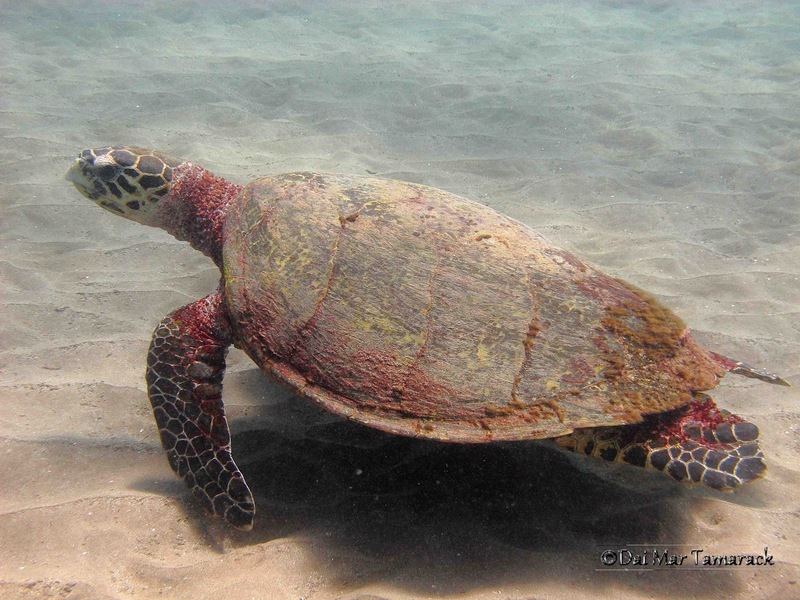 The serrated shell and sharper beak also give this turtle away as being a Hawksbill. 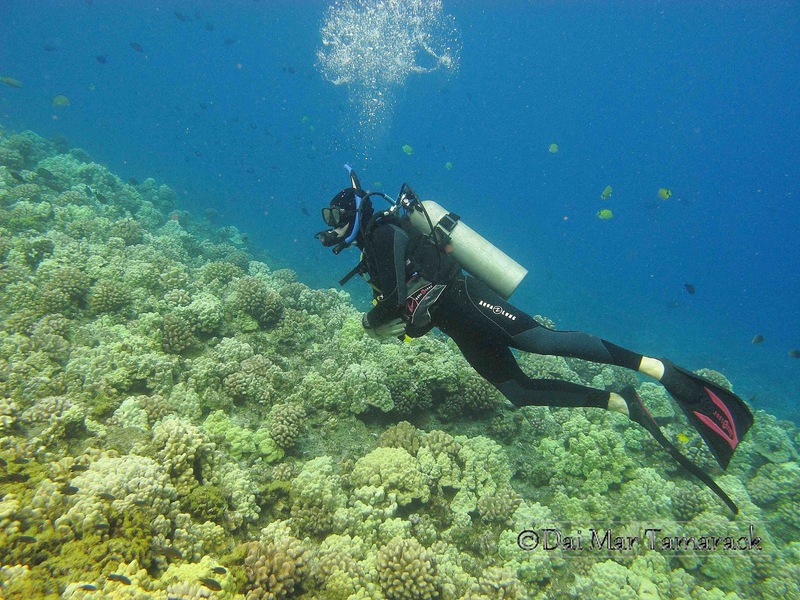 After a year and a half of scuba diving out here in Maui Heidi was pretty shocked I raced off to chase a turtle. She understood later when I said it was a hawksbill! 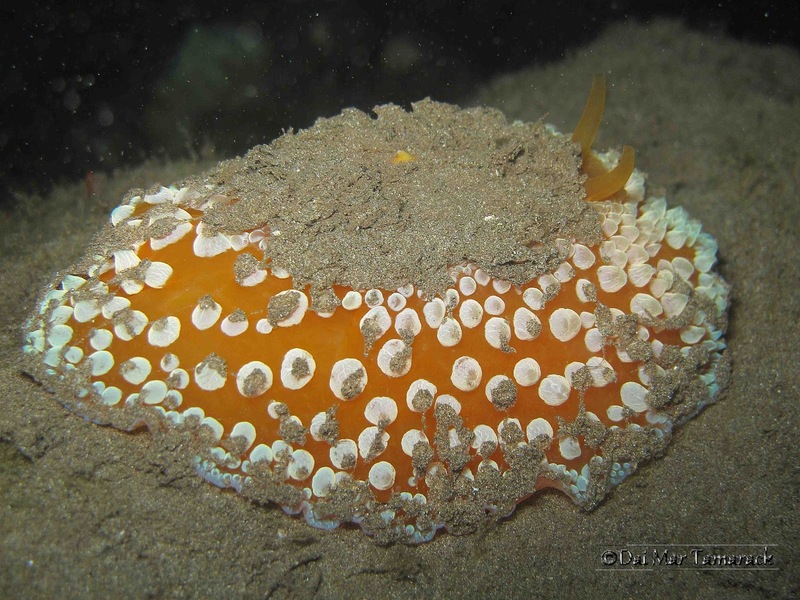 This is Heidi's gold lace nudibranch she found crawling over the sand. 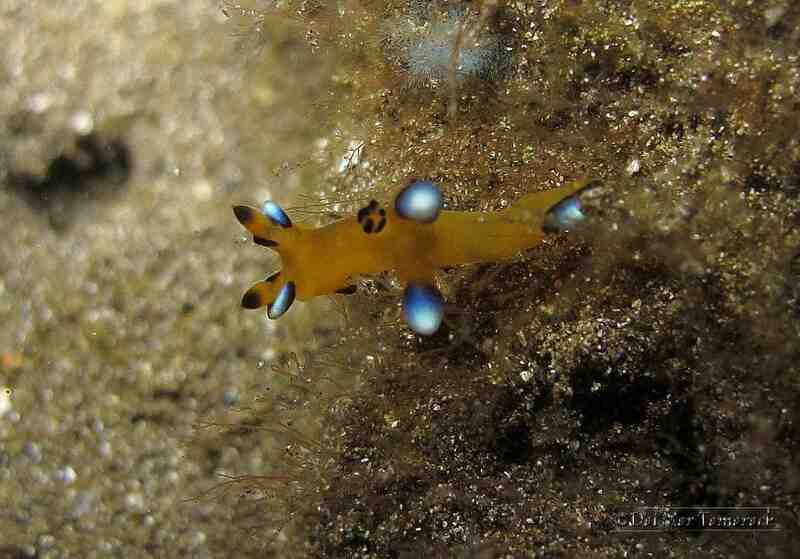 I love the way it looks like electricity going from point to point on these nudibranchs. Once it crawled onto Heidi's hand it didn't want to get off. 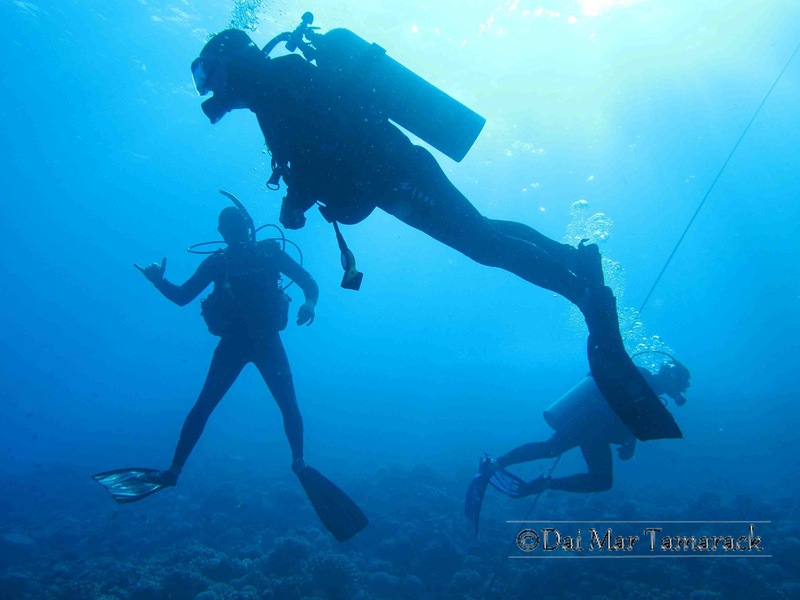 After a successful boat dive to Molokini the Maui Diamond II took us to one of their favorite spots, Wailea Pt. 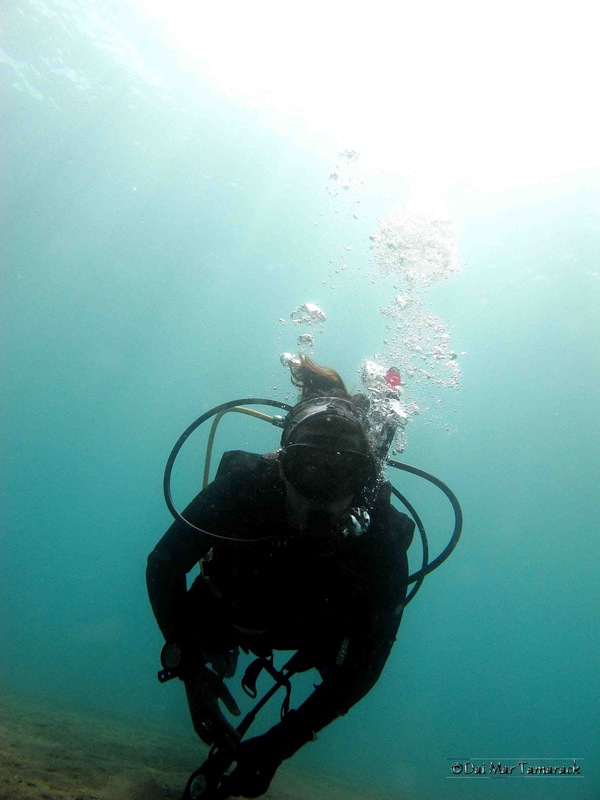 It was a bit windy and choppy at the surface but once we descended the peace and tranquility that comes with scuba diving immersed us. 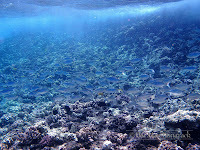 Josh, our divemaster, wanted to show us this satellite rock located far off the reef so we headed off over the sand. 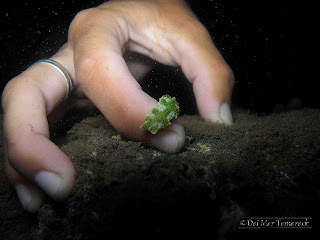 There were a few tiny little rocks with baby eels and damselfish on the way and also a lot of halimeda grass beds where the very rare sea horse reportedly hides. 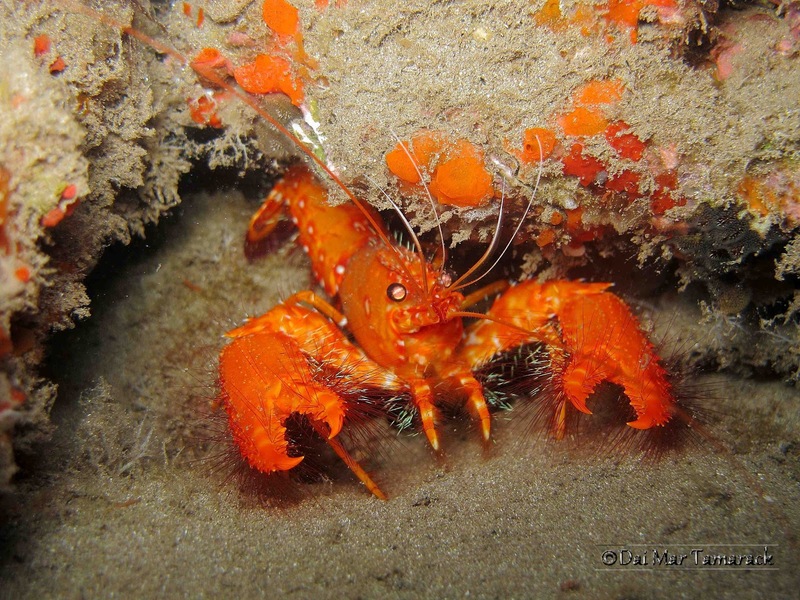 I didn't see a sea horse but we did come across a very interesting site. 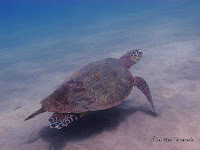 One sea turtle was held fast on the back of another in a mating position as the other flapped its flippers slowly rolling over and over on their way up to the surface. I have seen this behavior just a couple of times here in Maui but the really interesting thing is that pretty much all the actual mating occurs in the near shore waters of their nesting grounds about 700miles north west of here in the French Frigate Shoals. And when I looked closer at the tails of these two turtles I noticed that both had very long tails, which means they were both male! So maybe they were just practicing for the big event? After a little hitch with my tank being out of air at 50ft I finally made it back to the satellite rock with a fresh tank of air. 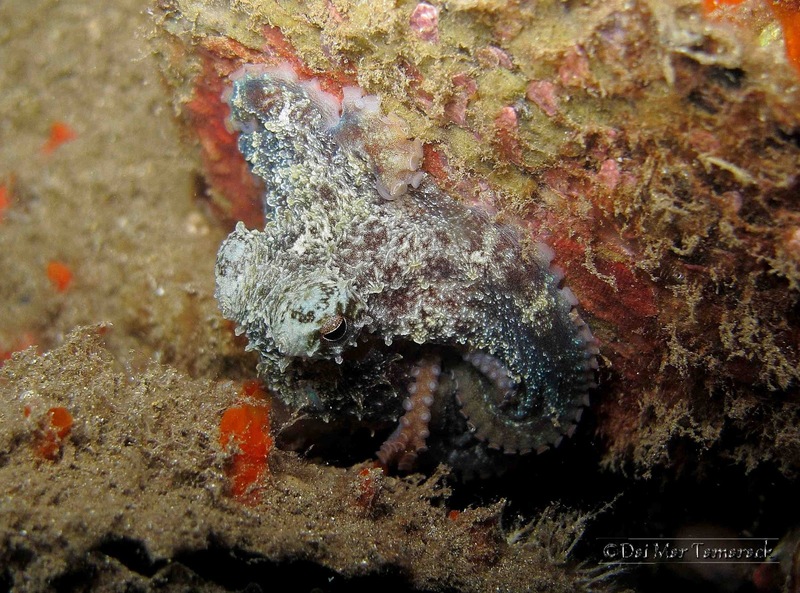 I have been to Wailea Point a dozen times scuba diving and have never seen this rock. It was amazing. 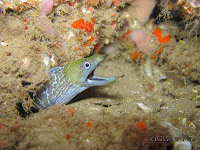 Rare bicolor anthias shared a crevice with a huge yellow margin moray eel. 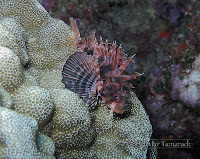 Green lionfish skirted around the edges while a devil scorpion fish plodded around the sand next to the rock. 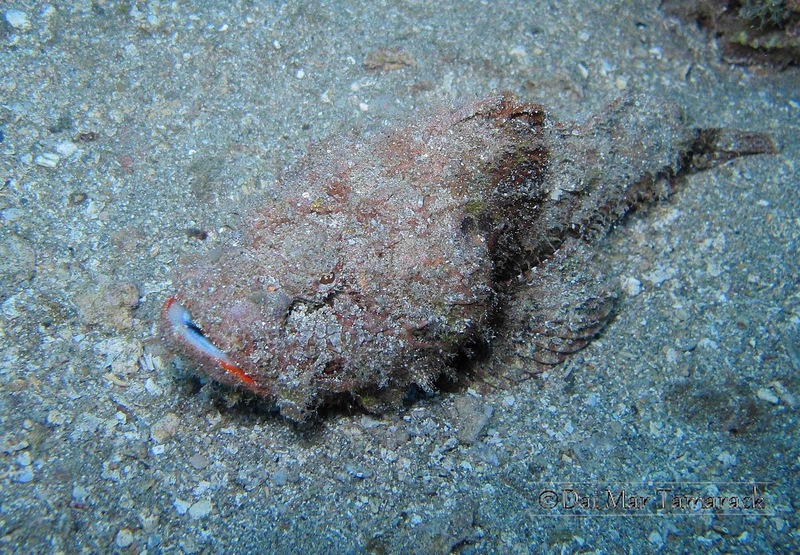 The devil scorpionfish was doing a funny walking motion across the sand which I hadn't seen before. 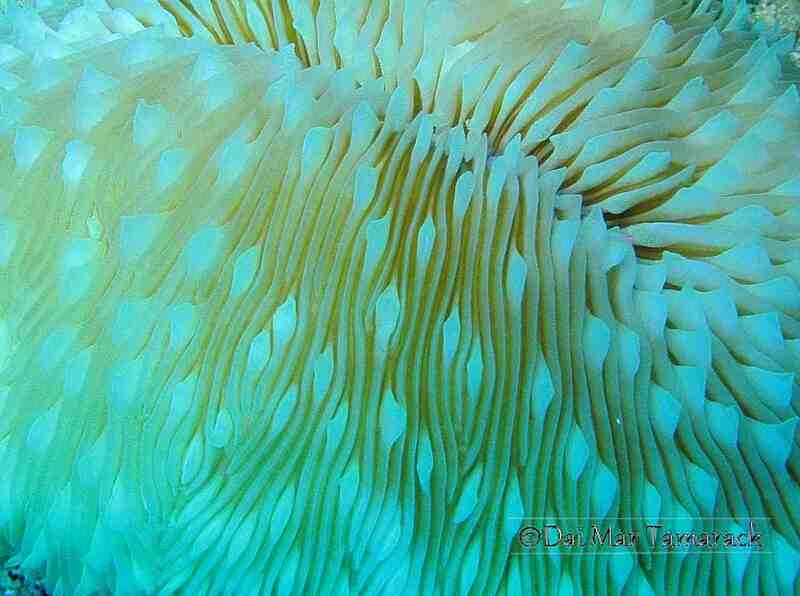 The rest of the dive was spent with so many sea turtles that I lost count. One in particular proved to be a very good photo subject the way it was awkwardly resting its head on the coral. It doesn't look very comfortable does it? But he was pretty content so I snapped a picture and moved on. 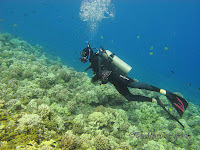 Maui has a plethora of shore diving opportunities which keeps me very busy, but whenever I get a chance to go out on a dive boat I jump at it. 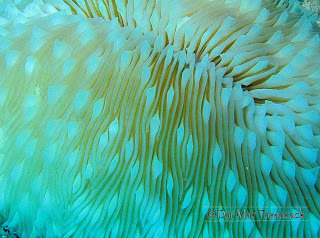 Today I went out with Maui Dreams and was happy to see both divemasters were my good friends, Josh and Jess. 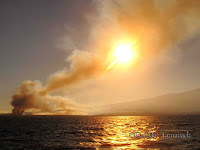 The sunset was beautiful on the drive to the harbor and an early morning sugar cane fire made the scene more breathtaking. It was a sign of things to come. 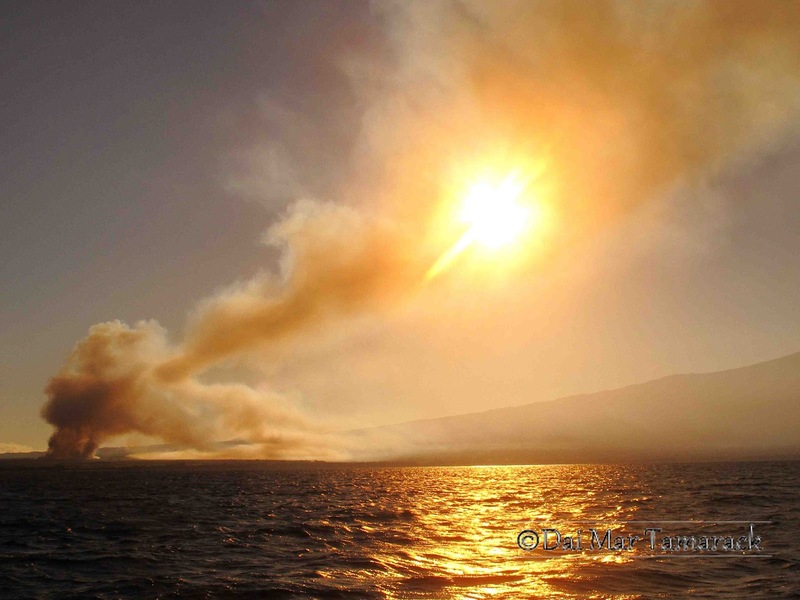 Not burning to come, rather beautiful sights. 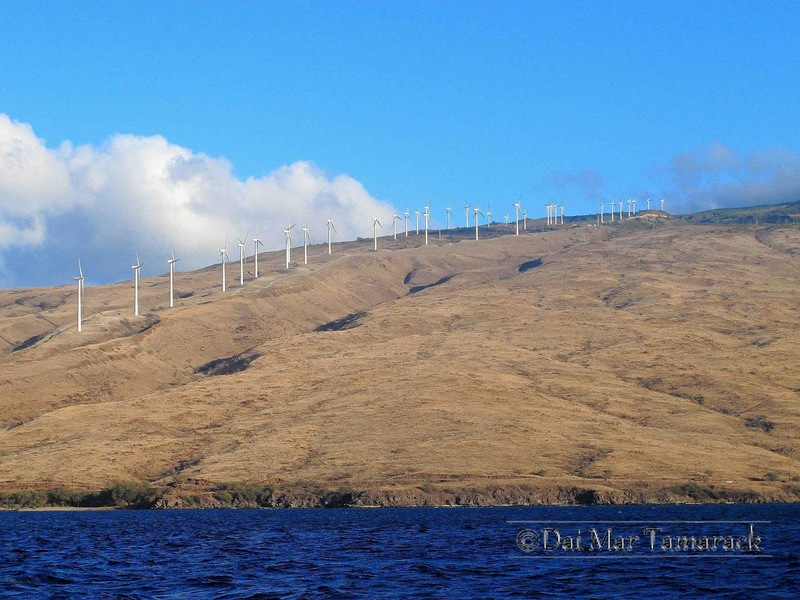 As the frigate birds perched on Molokini watched over us we descended along the Enenue side of Molokini. 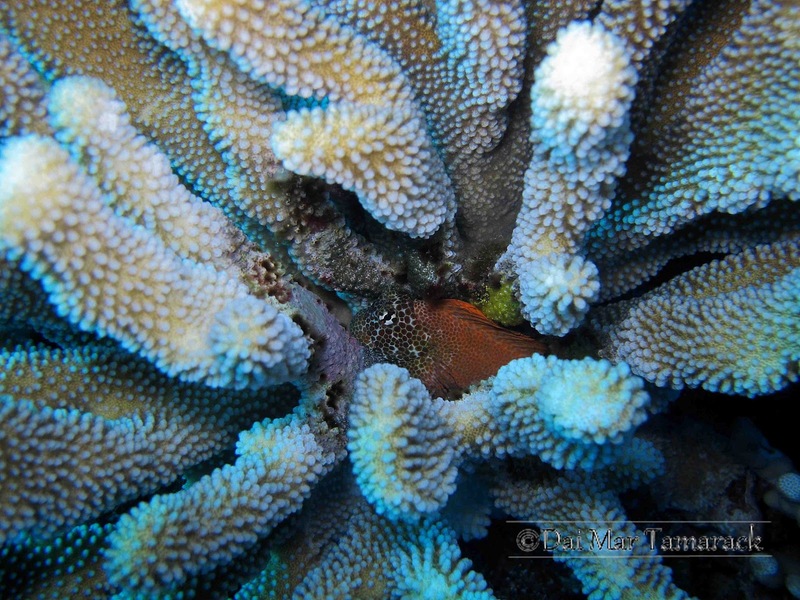 A white tip reef shark awaited us about 100ft down on the sandy slope below the reef line but I was interested in smaller things today. 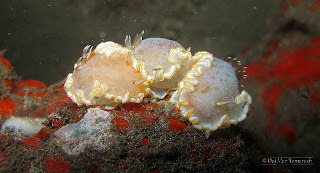 Nudibranchs! And lucky enough for me I found a couple of really good ones. 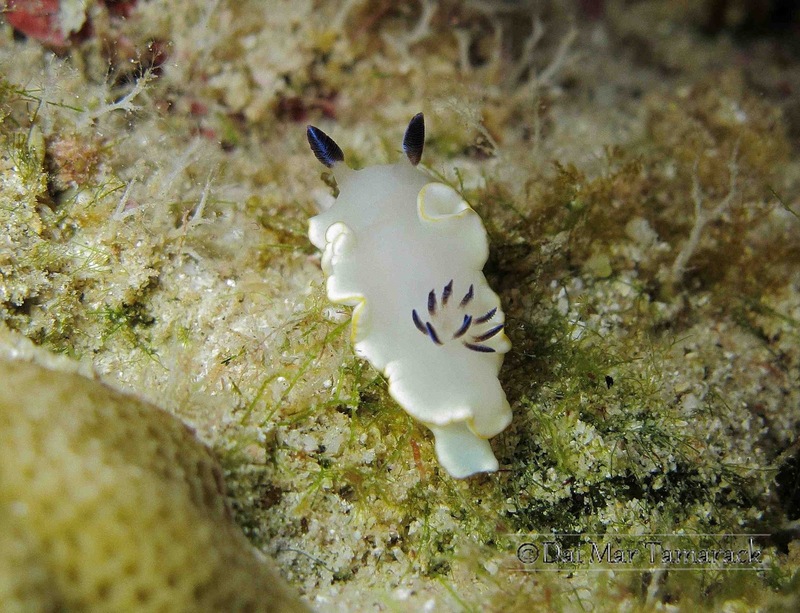 The blue dragon nudibranch is common to find on Molokini dives, but rarely seen anywhere else on Maui. 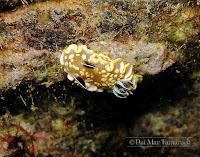 The I came across a beautiful white nudibranch with a gold rim which I had never seen before...which is a big deal at this point in my Hawaiian nudibranch hunting. 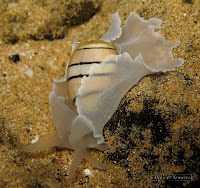 I had to go home and look it up and it turns out it is a rare Ardeadoris scottjohnsoni. In for a closeup with a really big yellow margin moray eel was the last photo I could snap before having to ascend up to the shallows for a safety stop. Even then the clarity of Molokini water makes for some great photos.